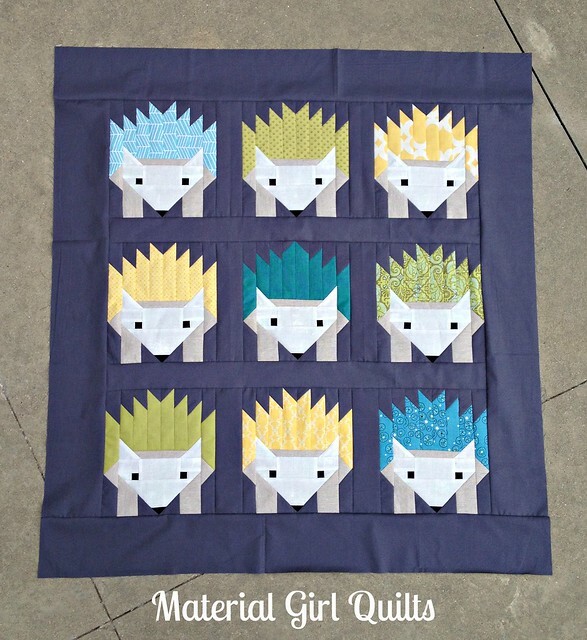 Let me introduce you to Hazel and the Hedgehogs 🙂 This is without a doubt the cutest quilt I have EVER made!! This quilt is for a dear friend who is expecting her first baby soon. The gender is a surprise and when I saw Elizabeth Hartman’s new quilt pattern (found here), I just knew what I had to make. My boys and I decided that she’s the lead singer of her punk rock band named “Hazel and the Hedgehogs”. She takes center stage in the quilt and I think it’s just perfect that way. 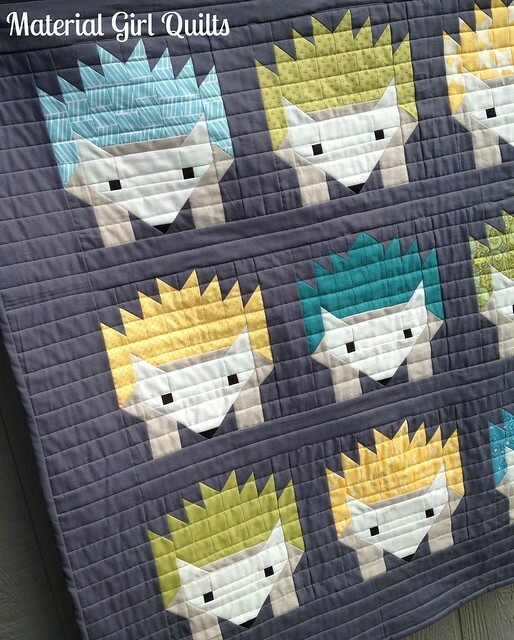 Previous article	← I’m Teaching a Swoon Quilt Class!! This quilt makes me so happy too! Love it!! 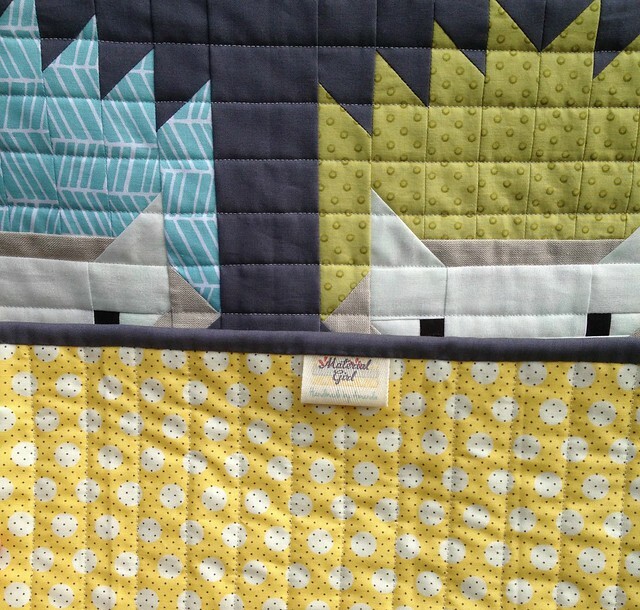 This quilt is unbelievably cute! Great job! 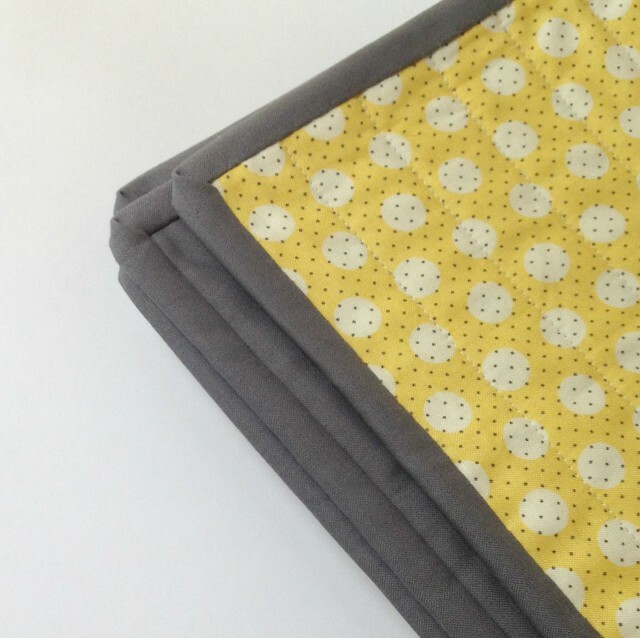 I love the colours you’ve chosen, and the backing is perfect! I love this quilt! I am thinking about buying the pattern but am hesitant because it looks like it will take a long time to piece. Was it fairly quick? This is so sweet! I just bought myself a copy of this pattern. Love those hedgehogs! Hazel and the hedgehogs. So sweet. You might have to make one for yourself. Some quilts are hard to part with, I’ve only made lap size or fractionally smaller ones and give them to family and friends. Some just on the spur of the moment . But keep a few lovely fabric favourites for my self. Super cute! And Hazel is awesome! Your quilt is adorable!! Sure to make the recipient very happy! So well done … Love it! 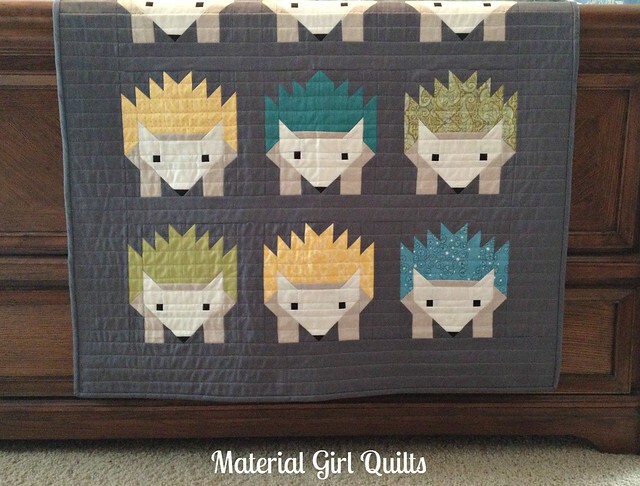 That quilt is just completely adorable! Cute, cute, cute!!! I love how cleverly this pattern shows off those pretty prints. And I love the straightline quilting. Nice job, Amanda! What a superb design, a real HIT!!! Love the band name too! I will never think of hedgehogs the same way again. THIS MAKES ME SMILE! So very cute. Great job – love all the fabric choices. Yah!! I’ve been wanting to make this, and your baby version is to darn cure!! The best gifts are the ones that are hardest to give…. Totally love this one too!! I absolutely love this! Well done! I said good morning to a hedgehog just the other day when I went out to walk the dog before breakfast, so this quilt is cool! Adorable and good job on using up some scraps. PS I love the charcoal binding too. Your quilt looks great. You did an excellent job selecting fabric. I’m going to have to purchase this pattern. It’s too adorable! I am absolutely in love with this little quilt. I don’t know how you could possibly give it away. Is this a new pattern of yours? I really am thinking about getting it. I think this would work equally well for a boy or girl, baby or even up to older ages, depending on the fabric. I think I would even like it on my bed, it would look great in some modern fabrics too. cdahlgren at live dot com. nice…vry nice….I wanna also try dis !! !